As a parent at Toad Hall your child and family will be supported through their time with us. Our inclusion policy is very thorough stating all support we put in place, importance of working together in the setting and links with outside agencies. Since the SEND code of practice has been updated in September 2014 there is a much clearer emphasis on offering help at the earliest possibility, with children and young people with SEND and their parents or carers being fully involved in decisions about their support and what they want to achieve. This information is set out in the Children and Families Act 2014 and the new SEND Code of Practice 0-25 years. (A copy of the code of practice is at the nursery). The SEND code of practice is a statutory guidance on the duties, policies and procedures relating to part 3 of the Children and Families Act 2014 and associated regulations. The Children and Families Act focuses on outcomes and improving progress for children and young people with SEND and the act requires a joint approach across all agencies. The term Special Educational Needs and Disability (SEND) has a legal definition. A child with special educational needs will have a learning difficulty or a disability that will make it harder for them to learn than most children of the same age. A child with special educational needs may need extra support or help that is different to that given to other children. A child with special educational needs may need extra help because of a range of needs, such as thinking and understanding, physical or sensory difficulties with speech and language or how they relate to and behave with other people. 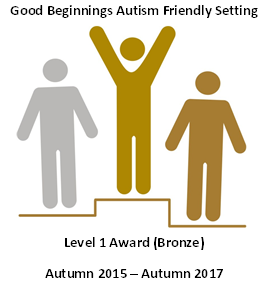 At Toad Hall we hold the Good Beginnings Autism Friendly Bronze Award.